Here is an arts and craft project that I just recently found in the April 2011 Issue of Family Fun magazine. I think its a good fit for this unit on MATTER. My version is a little bigger and I am using string instead of embroidery floss and a hard plastic straw instead of a chopstick. 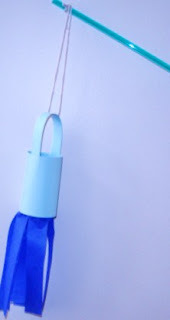 Children can have fun with AIR (a gas) by flying their mini windsocks indoors or outdoors! Measure and cut a 6 inch by 1/2 inch piece of card stock. 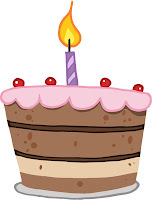 The students may want to decorate the card stock with crayons, paint, etc. 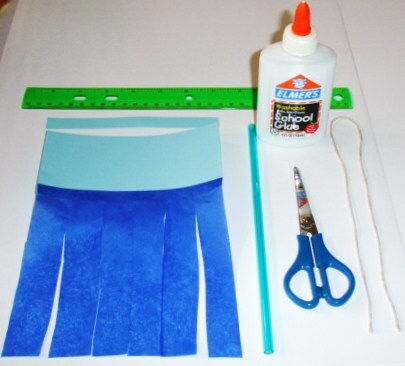 Measure and cut a 6 inch by 6 inch piece of tissue paper. Glue one edge of the tissue paper onto the large piece of card stock overlapping about 1/2 inch. This will be the inside of the windsock. Cut the tissue paper into strips from the bottom up to the card stock. Roll the card stock to form a tube and glue. Attach the ends of the smaller piece of card stock to the non tissue paper end of the tube with glue to form a handle. Thread the string under the handle and tie the string to the plastic straw or chopstick. Have fun flying the mini windsock through the air (a gas) and wind (moving air). Note: I found the hard plastic straws at Dollar Tree (12 straws for $1.00). 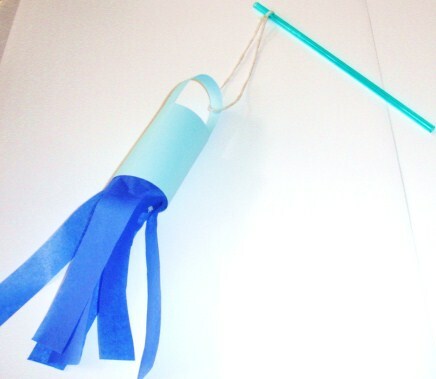 They are called "Party Straws". If you don't have card stock, I think a toilet paper roll covered with construction paper or wrapping paper might work even better. Linking up to Craft Schooling Sunday. Show the students a balloon that is not inflated. Brainstorm ways to blow up the balloon. (blow air into the balloon, fill it with helium, etc.) Discuss that all these ideas are ways to use a GAS to fill up a balloon. 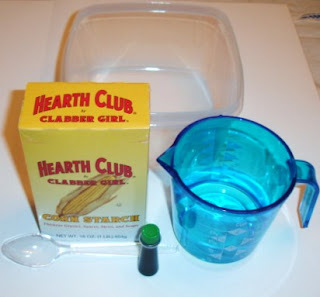 Show the students an empty recycled soda bottle, vinegar and baking soda. Have the students brainstorm ways to use these new materials to blow up the balloon. Have the students predict what will happen when they put vinegar and baking soda into the bottle. Stretch the balloon to make it easy to inflate. Pour 1 ounce of vinegar into the bottle. Pour 2 teaspoons of baking soda into the balloon. Carefully fit the balloon over the mouth of the soda bottle without letting any baking soda fall into the bottle. 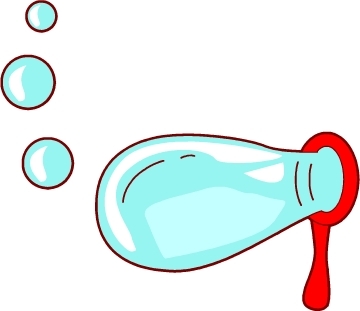 After the balloon is completely over the mouth of the bottle, let the baking soda fall into the bottle. Have the students explain what happened. 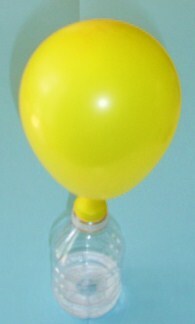 When baking soda and vinegar (or lemon) are mixed, they form a GAS (carbon dioxide) that rises up into the balloon and inflates it. 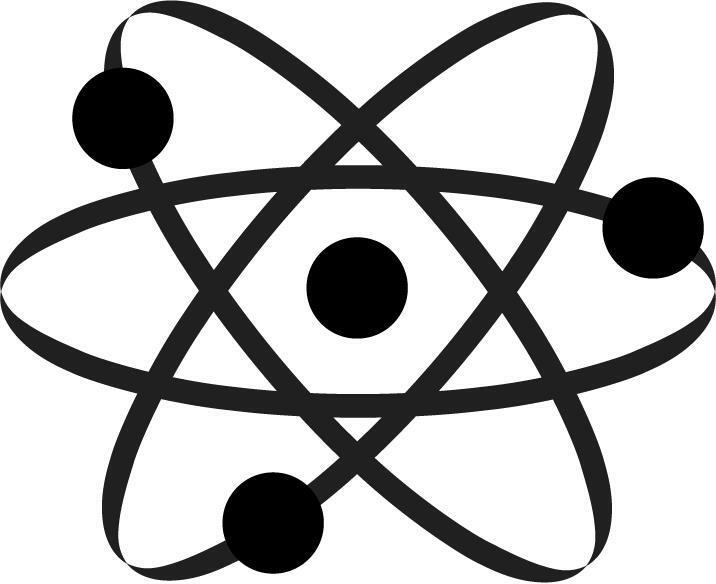 A physical change is a change of matter from one state (form) to another. A chemical change is a change that forms a different kind of matter. 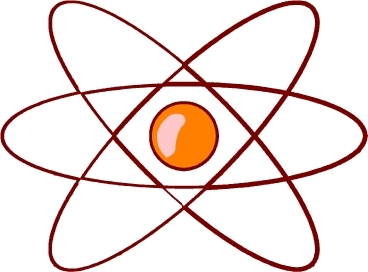 Here's a really cool video from Scholastic on Physical and Chemical Changes of Matter. Plus there is a follow-up online multiple choice test that the kids can take after watching the video. 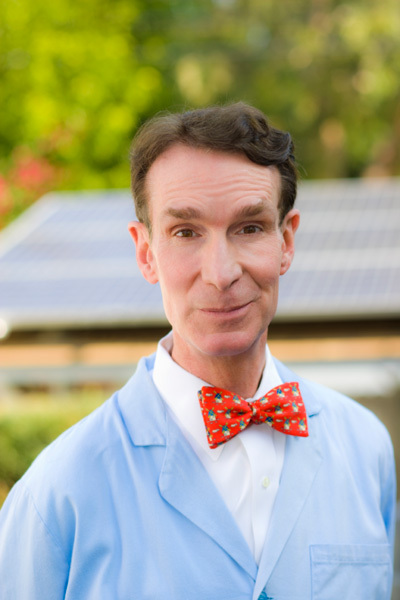 Here's another video By Bill Nye on Chemical Reactions. It has 3 parts. The Properties of Matter are characteristics that can be observed or measured. Here is a really cute video from Scholastic that teaches kids about 4 of the Properties of Matter. Plus the kids can take an online multiple choice test after viewing the video. Making Oobleck is a perfect activity when studying Matter because it presents characteristics of a liquid and a solid. Plus, it's an EASY, MESSY, and FUN activity which kids LOVE! Scientists call Oobleck a non-newtonian fluid because it acts like a liquid when you pour it but it acts like a solid when a force acts on it. You may need more cornstarch or water than what is listed above. Review the states of matter especially liquids and solids. Have children observe and discuss the materials needed for the activity. Pour the cornstarch into the bowl. Observe. Add the water slowly, stir, and mix. Observe. Students can finish mixing the Oobleck with their hands. Have students describe how it feels and discuss its characteristics. 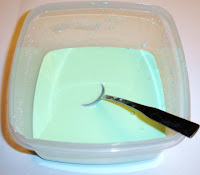 Try to pour the Oobleck into another container. Students could store the Oobleck in a plastic bag to use later. Wash all containers, utensils, hands, etc. Do NOT put any Oobleck in the drains! 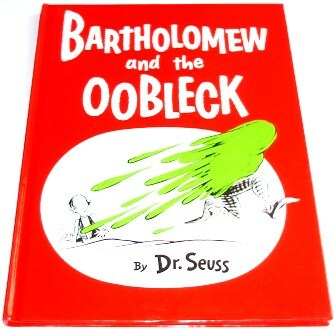 Read Bartholomew and the Oobleck by Dr. Suess. Compare and contrast the Oobleck in the book to the Oobleck the kids made. Other similar substances to experiment with are slime and silly putty. 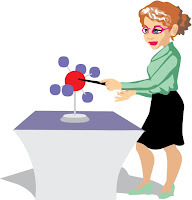 Here's a link to the Saugus, MA Public Library and their Silly Putty Saturday Science Activity. Science Bob has 2 recipes for Slime on his website. 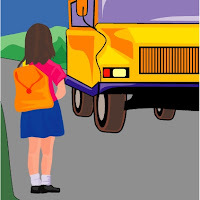 The Scholastic Website has a nice activity from The Magic School Bus for parents and teachers to use with the kids when learning about air pressure. "Air takes up space and pushes on everything it touches. If you squeeze air into a small space, the air pushes back with more pressure - air pressure." Have fun and enjoy science with Ms. Frizzle. If you haven't already discovered this website, I think you will bookmark it for the future! Wow! There is a wealth of information and activities here. It contains online educational videos, lessons, games, puzzles, and quizzes for students in grades K-12 although the section on matter is mostly for Grades 3 - 12. It also includes the 4th state of matter (plasma).The link below will take you to the section that is all about the STATES of MATTER. Have fun! The Scholastic Website has a nice activity from The Magic School Bus for parents and teachers to use with the kids when learning about molecules. "Everything is made of incredibly tiny molecules. The special characteristics of each thing - hardness, stretchiness, stickiness, and so on - are determined in part by the size, shape, and attraction of its molecules." How Many Drops of Water Can Fit on a Penny? 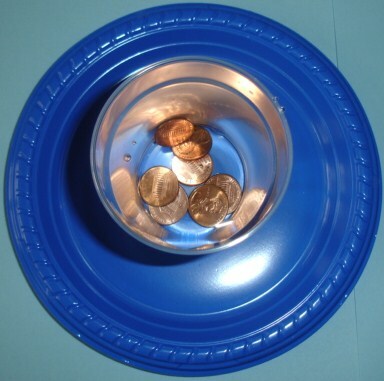 Have students observe a penny with a hand lens. 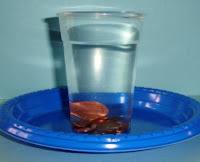 Have students predict the number of drops of water that can fit on a penny. Use an eye dropper to place drops of water one at a time on the penny until the water runs over the edge of the penny. Older children can repeat the experiment a few more times and calculate the average. 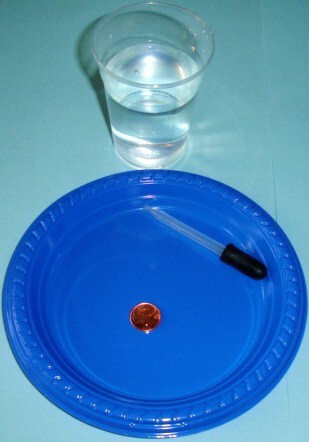 If it is their first time doing this experiment, children will probably be amazed at how many drops can fit on a penny. Most students will underestimate the number. Water molecules are attracted to other water molecules (cohesion). Molecules near the surface of a liquid pull toward each other. The cohesion of water molecules forms a kind of "skin" on the surface. A drop keeps its shape because of this surface tension. Older students can brainstorm ways to change this experiment. Perhaps use a nickel or quarter. Try the back of the penny. What other ideas can students come up with? 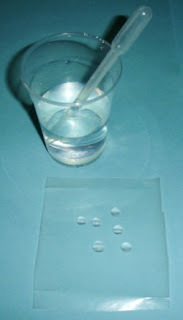 Another variation of this experiment is to use a cup of water filled to the brim. Have the students predict how many drops of water can fit in the cup without the water spilling over. Have them use a dropper to add drops of water to the cup. They should count the drops and record their data. Let's try another experiment with cohesion and surface tension. Place the cup on a desk or table with a pan/plate underneath to catch any overflowing water. Fill the cup with water to the rim. Predict how many pennies you can add to the full cup. Slowly and carefully drop a penny into the cup. Continue adding pennies in the same manner until the water spills/overflows. 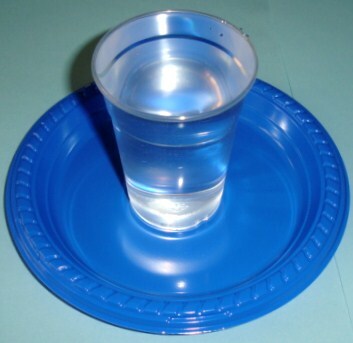 The water level actually rises above the top of the cup due to surface tension. The surface tension forms a kind of "skin" on the top of the water to hold the water together. Water drops are more elastic than we think! Help your children understand more about air! Books are a great way to introduce new ideas to children. I Face the Wind does a great job of explaining and illustrating the concept of air. This book is recommended for pre-k through second grade. The book also offers experiments you can try out at home. Reading this book to your children would be a great way to help introduce the idea of air. Kite Flying is recommend for pre-k through third grade. This story is about a family who make a kite to fly on a windy day. This book would be great to read before making a kite with your little ones! After reading Kite Flying watch the video below. You could compare and contrast the way kites are made. This video is a great tutorial for making a basic barn door kite. The video comes from ActivityTV.com. I just recently discovered ActivityTV and was pleasantly surprised by the amount of activities and ideas on the site. Nothing is better than having students actually experiment with concepts themselves. Allow students to take kites, pinwheels, and balloons outside to experiment with the air. I also found a tissue paper kite craft kit from Oriental Trading that would be a great activity for kids to further discuss kites, air, and wind. The kit comes with enough supplies to make 12 kites. To further a kite theme why not make a kite bulletin board? This bulletin board is from izzyshare.com and features students' poems. This would be a great way to cross the curriculum from science to literature. Maybe you have older students who need a bit more of a challenge. This teacher from izzyshare.com incorporated kites into her math lesson by having her students make fraction kites. It has been pretty windy lately in the Dallas area. I've seen a few kids with kites enjoying the wind. 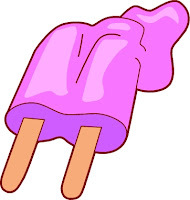 I may just have to make one myself and head outside! Hope you feel equipped with some good ideas to teach your little ones about air. Contact me at: ashlee@izzyshare.com - I would love to hear from you! Bubbles are Matter. They are made of air (gas) and a liquid. 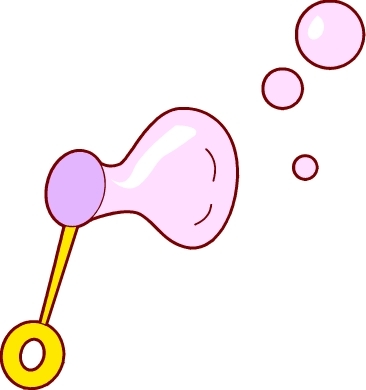 Soap bubbles are globs of air enclosed in a film of soapy water. 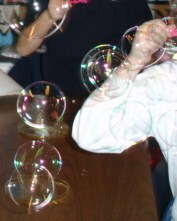 Children can make bubbles using homemade or store-bought blowers and bubble mixes. 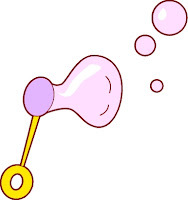 As the children wave the soapy wand or blower in the air, they are adding the air (gas) that forms the center of the bubble. 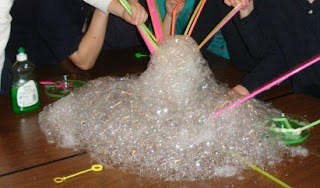 Let the kids have fun experimenting with bubbles. See who can blow the biggest bubble. See who can blow the longest lasting bubble. 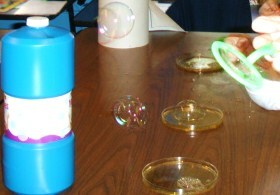 Have the kids make different bubble solutions and use different bubble blowers to see which works better. Have the children choose a criteria (biggest bubble, longest lasting, etc. ), then predict which mix or blower will work the best. Compare a store bought bubble mix to a homemade mix. When the children have finished experimenting with different bubble solutions and bubble blowers, have them draw (and label) a picture of today's activities using the terms: air, gas, and liquid. To make larger bubbles use more dishwashing detergent. Here's a simple activity to observe if molecules attract. 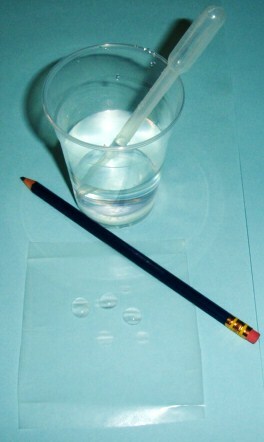 Use the dropper to place a few drops of water on a piece of waxed paper. Review the meaning of attract (to pull together). Have students predict if the water molecules will attract each other. Use a pencil to push 2 drops of water together. Do this slowly. Observe how the water drops pull together to form one drop. This attraction of molecules is what holds matter together. Here's another video on the Gamequarium website by Bill Nye the Science Guy. This one is on Atoms and Molecules. Bill refers to matter as "stuff" and he refers to atoms as "tiny pieces of stuff". This video has 3 parts. Please click on the link below. 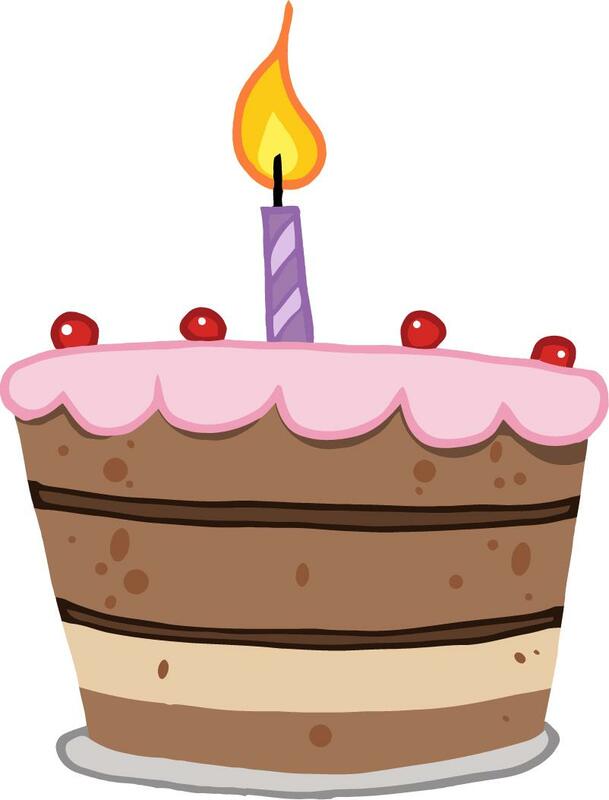 Air is made up of gases. Have the students create a circle graph to display the above data about air. 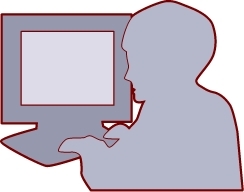 Students can make their own graph by hand or they can use Kids' Zone, a wonderful website to make a graph. Water (a liquid) freezes at 32 degrees F. or 0 degrees C.
Water (a liquid) boils at 212 degrees F. or 100 degrees C.
Have the students create bar graphs to display the above data about the freezing and boiling points of water. Can you Change the Freezing Point of Water?